The fur trade influenced the historical development of Canada in a number of ways including: the development and expansion into western and northern Canada; the significance of Canadian place names; the origin and rise of the Métis Nation; the impact of interaction between the First Peoples and the Europeans-and these connections can be found in personal and commercial stories about the people and events of the fur trade. Copyright Holder: Expired; no restrictions on use. Please credit The Hudson's Bay Record Society. This is an affidavit summarizing the English claim to Hudson Bay. 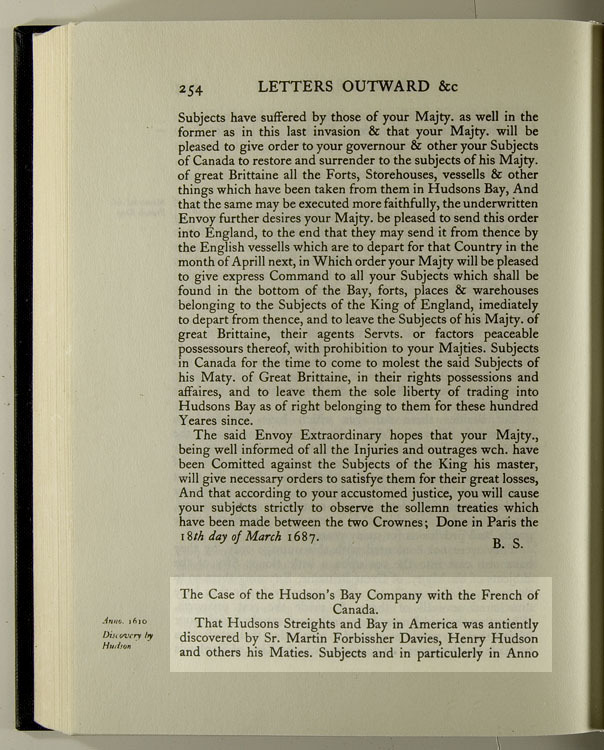 The Hudson's Bay Company was trying to sue the French for the destruction of three HBC forts (Charles Fort, Moose Fort, and Albany Fort) in James Bay ("The Bottom of the Bay") in 1686. Pierre de Troyes (the Chevalier de Troyes) marched overland from Quebec to James Bay with 30 regular soldiers and about 70 Canadian militiamen: the English were largely taken by surprise and offered little resistance, and de Troyes captured all three forts and an HBC sloop without losing a single man. The writer, Thomas Pinfold, begins his statement by emphasizing Henry Hudson's 1610 exploration into the straits and bay, and points out that all maps recognize his feat by featuring these bodies of water with his name. p254-256, 3rd pgh: "The Case of the Hudson's Bay Company... the French ever made into Hudson's Bay." with the French of Canada. That Hudsons Streights and Bay in America was antiently discovered by Sir Martin Forbissher Davies, Henry Hudson and other his Maties. Subjects and in particulerly in Anno 1610 Hudson made a more full discovery of the said Straights and Bay by which name it has been ever since called in all Mapps etc. Two yeares after Sir Thomas Button Sayled thither and tooke possession for King James and perticulerly of Port Nelson where hee buryed the Comander of his Shipp whose name was Nelson, which name it retaines to this day. That in 1631 Captain Fox by Comand of King Charles the First Sayled amongst other places to Port Nelson and Reerected a Crosse which had been formerly Sett up by Sir Thomas Button with a new Inscription declareing his Maties. Right thereto and named the adjacent Country New North Wales as it's called to this day in all Mapps etc. That in Anno 1667 one Zachary Gilham a Subject of his said Maties. Sayled into the said Bay and Discovered att the Bottome of the Bay a River which hee called Rupert River and built a Forte there calleing it Charles Forte as it's now called and there Settled a Trade with the Natives makeing a League of Freindshipp with them. That in 1670 His late Matie. by Charter grants to the said Company the Sole Trade of the said Straights and Bay with all Lands Territoryes Rivers and Islands in and about the said Straights and Bay. That in all this time the Subjects of the French King doe not soe much as pretend to have Sayled to or discovered the said Bay or Straights. That in 1672 the Company sent one Mr. Bayly their Governor whoe Ratifyed the League made by Guilham with the Indians and held a faire Correspondence with Monsr. Fantenack [sic] the then Governor of Canada whoe did not soe much as pretend any Injury done the French by the English Settleing Factory's or building Forts in the Bottome of the Bay. That in 1682 one Monsr. De La Cheney and other Private Merchants of Canada findeing that the English at their greate expence were like to Settle an advantageous Trade in the Bay fitted out Severall Shipps and sent one Grosileir and Radisson whoe entred Port Nelson and burnt the Companyes houses Seized their Goods and Provisions and destroyed their Factory carrying Mr. Bridgar the Company's Chiefe Agent and Severall others of his Maties. Subjects prisoners to Canada for which Injustice Radisson and Grosileir were proceeded against at Canada as Pirates and Complaint was allsoe made at the Court of France but noe satisfaction obtained which was the First Expedition the French ever made into Hudson Bay..."
Find more material on the on-going 'Battle for the Bay' - enter 'battles' in the search box to your left. View one artist's perception of a battle at sea. Check the Beaver Index - e.g., enter 'Albany Fort,' 'Gillam,' 'Frobisher,' 'Frontenac,' etc. The 'Radisson' mentioned in the affadavit was the same Pierre Esprit Radisson (c. 1640 - c. 1710) who had first interested the English court in the fur trade of Hudson Bay. Radisson served the HBC from 1670 until 1675, but then returned to France. In 1682 he entered the service of the Compagnie du Nord, established in New France that year, and sailed for Port Nelson, where he captured not only John Bridgar of the HBC but also a group of New England merchants (led by Benjamin Gillam, the son of Zachary!). Radisson returned to HBC service in 1684 and finally retired in 1687. The 'Grosileir' mentioned in the affadavit was Jean Baptiste Chouart, Radisson's nephew and son of Radisson's long-time travelling companion, Medard Chouart des Groseilliers.